They are some of the most amazing football fans in World Soccer; therefore it's only fitting they get their own range of gear. 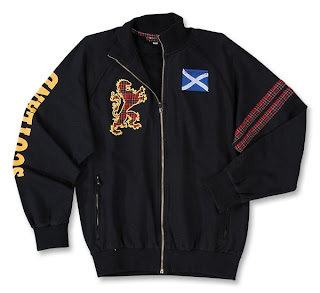 All three officially licensed products are made by the Scotland team shirt provider - Diadora - of 80/20 cotton/polyester for the best in comfort. 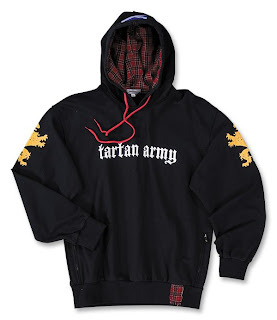 The Tartan Army is a name given to fans of the Scotland national football team. 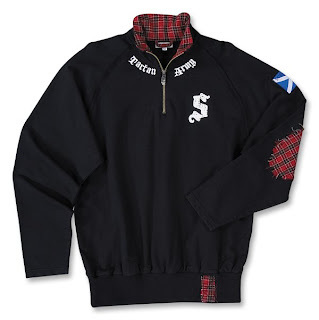 The name originated from the wearing of tartan at football matches and when travelling abroad. During the 1970s, Scotland fans became notorious for their hooliganism, particularly after they invaded the Wembley pitch and destroyed the goalposts after the England v Scotland match in 1977. Since then, the Tartan Army have won awards from UEFA for their combination of vocal support, friendly nature and charity work. Among them a Fair Play prize by the Belgian Olympic Committee; were named as the best supporters during the 1992 European Championship. They were also presented with a trophy for non-violence in sport and were voted by journalists to be the best supporters for their sense of fair play and sporting spirit at the 1998 World Cup in France. Consequently, countries drawn against Scotland often welcome the arrival of their fans.